What's the deal with the CLM Public URI? Far too many times I have seen the mistake where a customer has installed one or many of the CLM applications and either failed to set the Public URI or set the Public URI to something that is not appropriate, such as a host name tied to the network infrastructure. It is important to give thought beforehand about how you would like your clients to access your CLM links and applications. This means, that a scalable URI design needs to be created (to allow more applications to be added) even before the first CLM application is deployed. Why is it important? Its important because the URI is the de-facto unique identifier that customers and integrations will use when linking to CLM data. Any change to this URI (due to a host name changing for example) can have implications to not only links embedded in emails and bookmarks but other application integrations (including the CLM integrations RM, CCM and QM). You generally want a URI that reflects the static business meaning of the data that is being linked to. For example: https://jazzdev.ibm.com/ccm is good, https://aix61boxonmydesk.ibm.com:7255/ccm is not because it identifies both the hardware hosting the application and the port. If Public URI is set then no reverse lookup needed the public URI setting is used. end. If public URI is not set, the host name must be determined through getting the IP address for the primary network device then name resolution will do. If server IP address is not resolvable on the server itself (either in hosts file nor lookup) then an exception is thrown and IP address is used. Which host name? Which network device? There could be many combinations. Even if this worked, it is still not good enough! Why? Simple example exercise.. I want to host RTC on my work laptop, and i don't know what my public URI should be. Let me try to find out. No good. This is because i do not have a DNS entry for my laptop's host name. Let's try my NIC IP Address? Also not good.. DNS has no entry for this IP. Even if it did, it would be purely local to the subnet! (192.168.x.x). My Wireless NIC? Resolves locally on my home network but not publically. Now what is my ip address (I am using a VPN tunnel)? What is the hostname that corresponds to this IP? Bingo! So I should use tpborisk7.torolab.ibm.com as it seems to be publicly addressable but its simply a bad public URI (machine name plus location). So how is CLM supposed to figure this out? My laptop has have 10 network devices, some with resolvable names, some not. What is also key here is that neither my NIC nor my host name is the real public address! Hence the need for a Public URI! Put the same thought behind the CLM public URI as you would for a URL you would host pages or application for the general public on the internet. It should be thought of,designed and owned by CLM! Luckily, For people who are in the unfortunate predicament of having a bad public URI, there is hope in 4.0 with server rename. 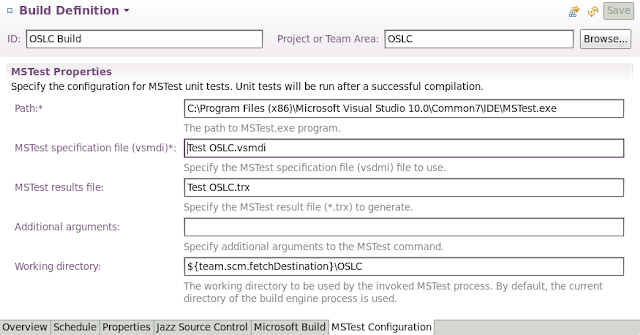 This is the third part of a blog series on using Rational Team Concert (RTC) with Visual Studio (VS). In part 1, I showed how to set up a basic solution in visual studio integrated with Rational Team Concert. In part 2, I provided a working OSLC sample which we will use in an automated build. 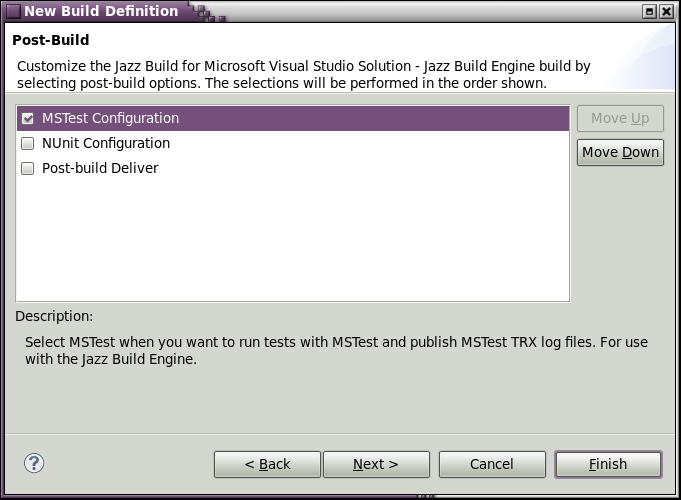 We will set up an automated Jazz Build for Visual Studio using using the Jazz Build engine. To keep text editing to a minimum I will provide the visual studio solution which has all the files required to perform an automated build. You can find it here. Unzip this over the corresponding directories in the solution created in the first two parts or if you are starting from here just unzip this and add it to the correct components (as specified in the first part) in RTC. 1. 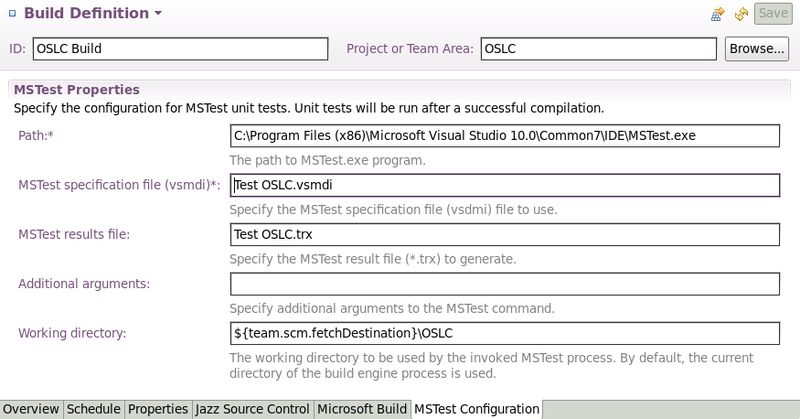 To keep things simple we will set up the automated build on the same machine as the visual studio. 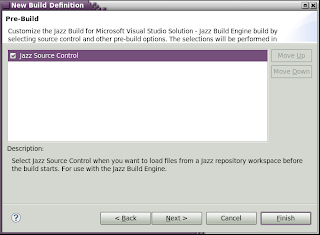 Install the Jazz Build Engine (JBE) in the default directory. In my case, this is the C:\Program Files (x86)\IBM\TeamConcertBuild directory. 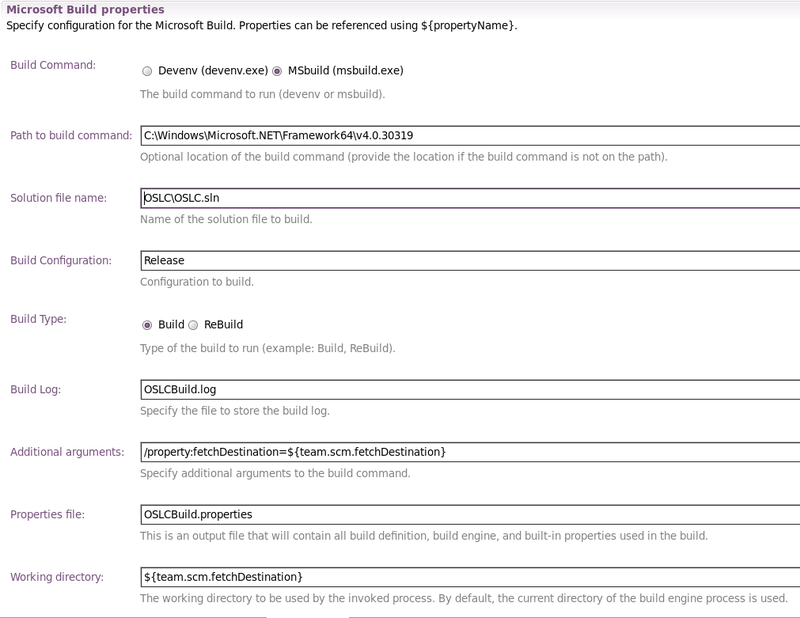 You will see that all property files are configured with the assumption that the build engine is installed here. 2. To, once again, keep things simple, we will use the current user (the one you used to log into visual studio) as the build engine user. The first thing we need to do is create a workspace which will be used by the build engine to do the build. 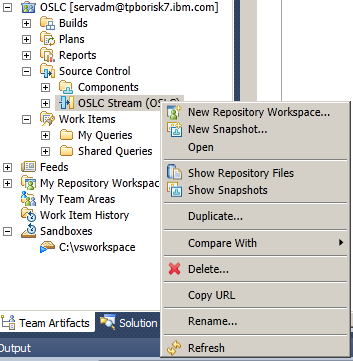 Go into Visual Studio and create a new repository workspace from the "OLSC Stream". Right click on the OSLC Stream in the project area and click "New Repository Workspace..."
2. At this point we will need to prepare some files in order to facilitate the build. 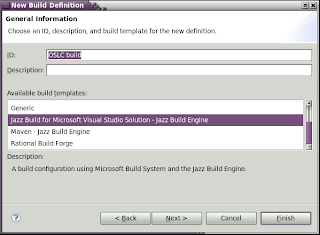 We will be using the MSBuild process to perform our build and we will need to augment it so that it communicates with the jazz repository once it starts and finishes. 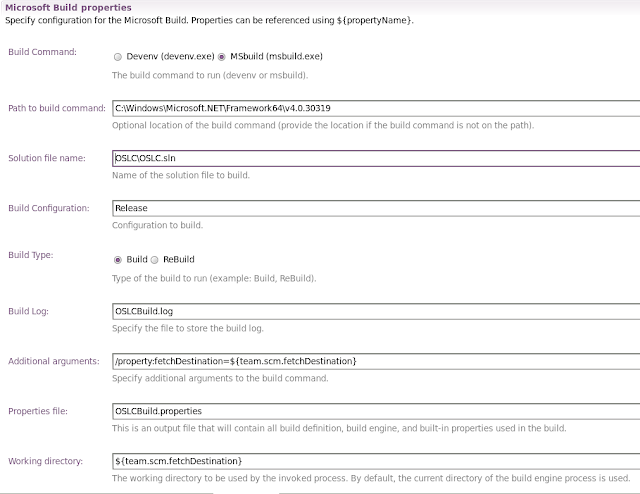 MSBuild uses the .proj files to build and we need to modify this file to add some pre and post-build hooks. To do this we would need to change the "OSLC Consumer.proj" file. To modify this file from visual studio it needs to be unloaded and edited. This can be accomplished by right clicking the project in visual studio, click unload and then subsequently "Edit OSLC Consumer.proj". This uses an OSLCProperties.xml which contains the properties that are used here: $(AntCommand), $(propertyFile) and $(jazzbuildxml). The $(fetchDestination) will be passed into MSBuild using a command line argument defined in the build definition. (We will do this later). You will find the OSLCProperties.xml in the solution directory (the root directory of the work space and contains the following. You may need to adjust the JBE root directory to reflect your environment. All of these new files should be checked in and delivered into the "OSLC Stream" so that they may be used by the Build engine. 3. 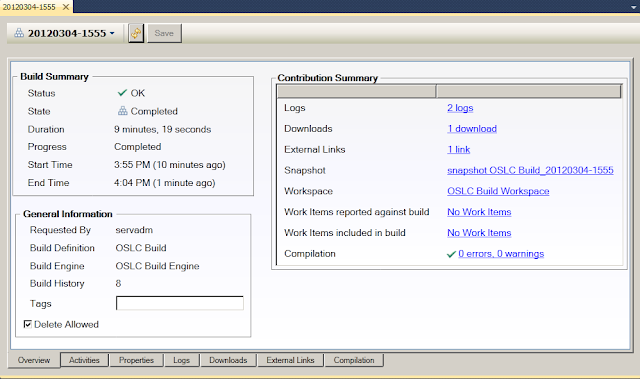 Now lets create a build engine and build definition in Rational Team Concert for eclipse. 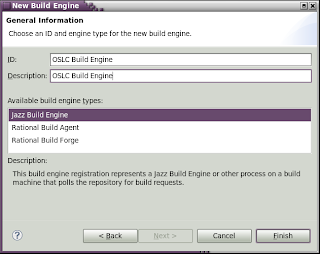 Launch RTC for eclipse and create a "Jazz Build Engine" build definition for the OSLC project area by right clicking on "Build Engines" and give it the name "OSLC Build Engine". This is a good indication that the build engine is not running. Lets start it now. 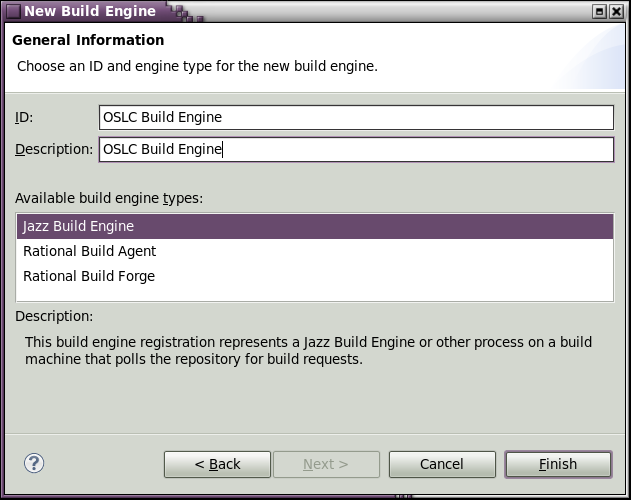 jbe -repository https://<rtc host name>:<rtc port>/ccm -userId <rtc build username> -pass <rtc build user password> -engineID "OSLC Build Engine"
Now refreshing the build engine page in RTC should eliminate the error. 5. 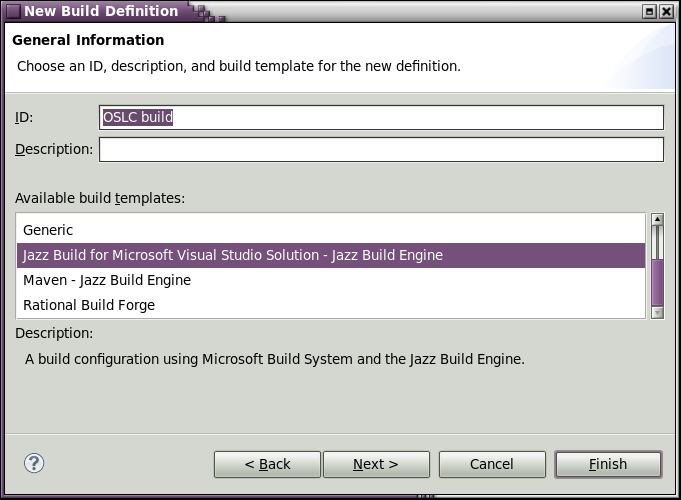 Next we need to create a new build definition called "OSLC Build" for the OSLC project area of type "Jazz Build for Microsoft Visual Studio Solution - Jazz Build Engine"
Select MSTest Configuration as a post-build option. Once you created the build it should be opened and now you must add the build engine we created previously as a supported build engine in the Overview tab. 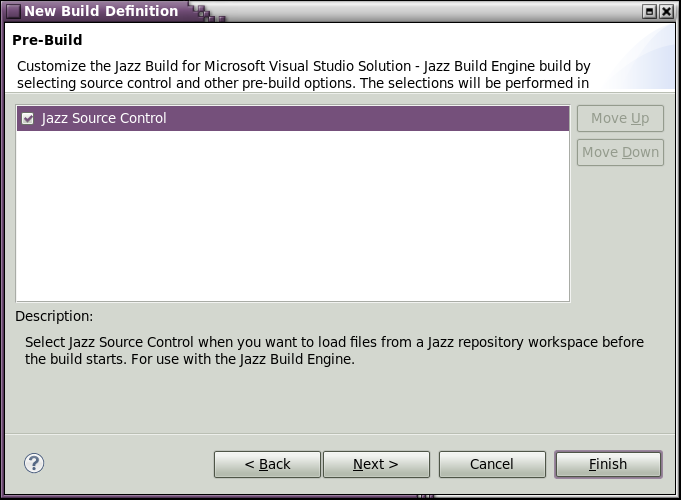 In the "Jazz Source Control" tab we must specify the workspace we created previously for the purposes of building as the Build Workspace and also specify a directory that will be used to load this workspace during the build process called "OSLC Build Workspace". We should also specify "Delete directory before loading". Some things to note on this page. 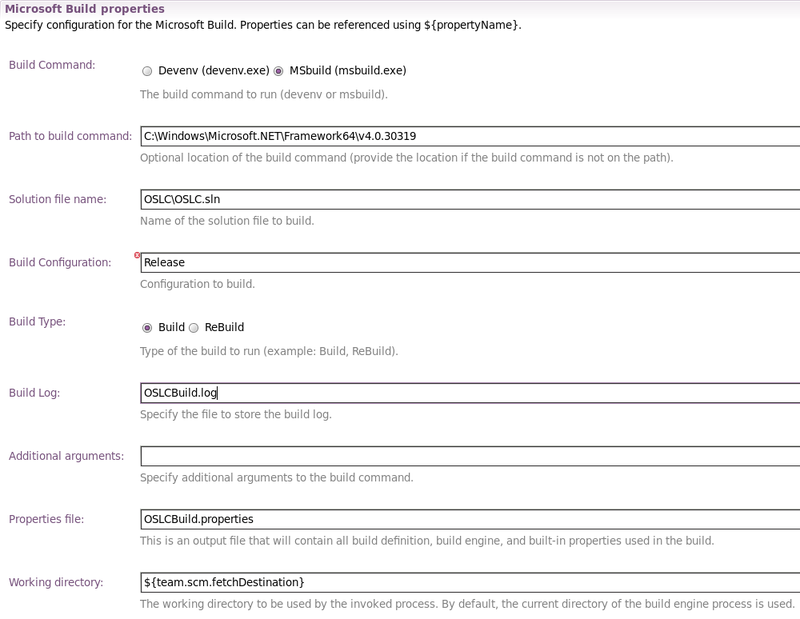 The OSLCBuild.properties file is a file generated by the JBE that contains the properties used during a build. You also see that here we are passing in the $(fetchDirectory) property that we are using above in the .proj hook. We are using MSBuild as it is more suitable for what we want to do but it is also possible to use the Visual studio "devenv.exe" to do the build. This is usually more useful if there are some visual studio integrations that the build depends on (pre compilers, etc.). 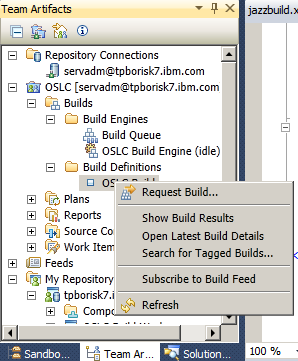 Now you should be able to save the build definition and then you are done with RTC for eclipse. 6. 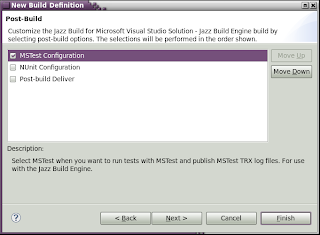 Go back to visual studio and refresh the builds area and now you should be able to request a build from here. You may do so now. Leave the default options and submit. 7. After the build request has been submitted you will see it in the build queue. It may take a little while to build and return eventually with a "Completed" status and a green check mark. 8. Whether the build succeeded or not you can double click on the build to see the results, including the logs and, if successful, a link to the resulting .exe in the "Downloads" tab. If something went wrong you can examine the logs to see what the issue is. Voila! An automated build using the JBE and visual C++!